As a self-confessed introvert and homebody, the prospect of a night home alone sounds like pure bliss. Throwing in a beauty treatment only sweetens the deal, and among the beauty treatments I can think of, a DIY facial ranks pretty high. The next time you find yourself at home with nothing to do, put on a girly movie (Clueless and Dirty Dancing are personal faves!) 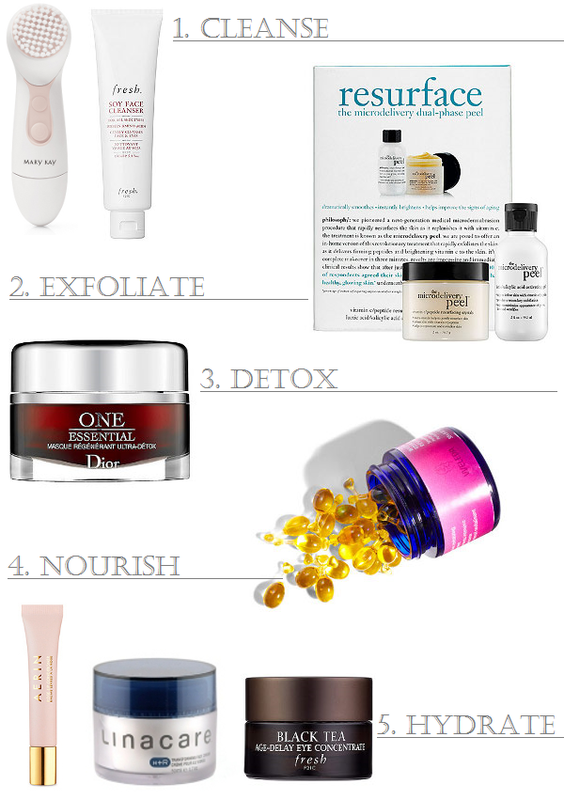 and indulge in some skincare TLC. 1. Cleanse. The first step in this facial routine is getting rid of makeup, dirt, and oil! Those who wear serious makeup might want to use a makeup remover wipe or cleansing oil first. But for a bit of BB cream and concealer, an effective yet gentle cleanser and a battery-powered cleansing brush are more than sufficient. Mary Kay Skinvigorate Cleansing Brush ($60; previously reviewed here) and Fresh Soy Face Cleanser ($17.50-45; previously reviewed here). 2. Exfoliate. Using a chemical exfoliant to gently slough off dry, dead skin cells improves skin's texture and tone, and lets subsequent products absorb better. I'm a big fan of this two-step system from Philosophy, which delivers impressive results at home in about 3 minutes. Philosophy Resurface - The Microdelivery Dual-Phase Peel ($70; previously featured here). 3. Detox. As I said in my previous product review, if your skin is good to begin with, the effects of this detoxifying, damage-reversing mask are much subtler because it has less work to do. However, I'm convinced the detox really works because every time I use this mask, I develop an acute thirst for caffeine-free herbal tea to help along the detox. Dior Capture Totale One Essential Ultra-Detox Treatment Mask ($100). 4. Nourish. A rich face oil or serum replenishes the skin after cleansing, exfoliating, and detoxing. I squeeze the contents of one capsule and apply all over my face and neck, and let it absorb over the next half hour. Weleda Wild Rose Smoothing Facial Capsules ($40; previously reviewed here). 5. Hydrate. As Cher realizes she's meant to be with Josh, or as Baby and Johnny triumphantly perform their Sheldrake routine, I like to slather on eye cream, lip balm, and moisturizer to lock in the benefits of the other treatments. AERIN Rose Lip Conditioner ($30; previously featured here), Linacare Transforming Face Cream ($58 at BeautyMark; previously reviewed here), and Fresh Black Tea Age-Delay Eye Concentrate ($100; previously reviewed here). Do you do DIY spa treatments, and if so, what do you use for at-home facials? A quick mask can still work wonders! Philosophy has such great skincare. They're more than just sweet-scented shower gels!